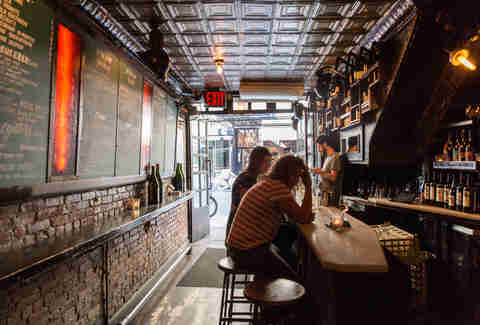 Once a neighborhood dominated by artists, skateboarders, and skateboarding artists, the Lower East Side is now more heavily inhabited by gingham-shirted Wall Street-types unabashedly spending $23 on a single drink. Still, among the high-priced craft-cocktail bars (which are certainly worth a visit) you’ll find the old-school skater dives, live music venues, and casual wine bars -- making the neighborhood one of the most unique drinking areas in Manhattan. Here’s a breakdown of everywhere you need to go, from cocktail hour until sunrise. 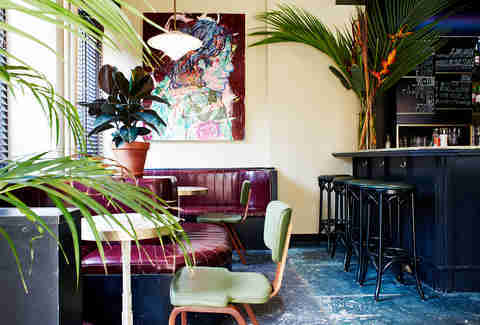 A gastropub from Mokbar chef Esther Choi, this plant-covered lounge offers strong, fruit-topped cocktails -- try the Parrot Cries With Its Body (rum, pineapple, coconut, yuzu, and a festive tiki umbrella) -- alongside Korean bar snacks, like K-Pop popcorn shrimp, squid fries, and larger plates, like roast chicken, served head-on and with a rice-based stuffing. Do note that the bird takes an hour to prepare, which means you’ll have plenty of time to work your way through the cocktail list. Popular long before its cameo on Master of None, this 101-year-old LES/Chinatown dive is the perfect spot to come with a group of friends for cheap drinks, kitschy decor, and mac & cheese served until 4am. Three dollar beers & shots from 12pm-7:30pm daily make it a popular pregame spot, though dozens of canned beers from $5 to $8 for the rest of the night means it’s just as well suited to the end of the night. 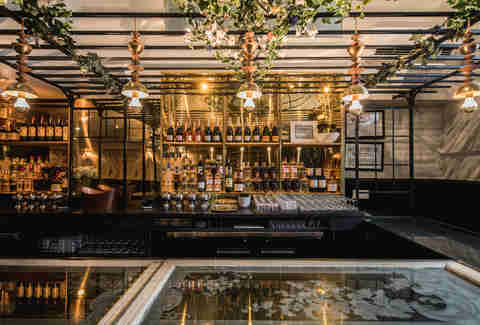 Those who shy away from grain-based beverages will rejoice in the cider-centric menu at Wassail, known as New York’s first cider bar. Opt for the $25 tasting flight including five 4-ounce pours of the well-curated ciders on tap (there are also cocktails, wine, and beer). A vegetable-heavy menu with snacks like tempura cauliflower keeps your night feeling just healthy enough. Quite literally your home for the night from the time you descend down the stairs and onto the dance floor, this taxidermy-decorated, chandelier-illuminated, exposed brick and sticker-covered den is a Lower East Side classic that’ll remind you of the not-quite-on-trend apartment of your rich friend’s older brother. The rowdy lounge doesn’t offer much more than well vodka sodas and cans of PBR -- but that’s enough to get you dancing to the always great music (which often skews old-school). Visit before 8:30pm on weeknights for $4 draft beers and well drinks. 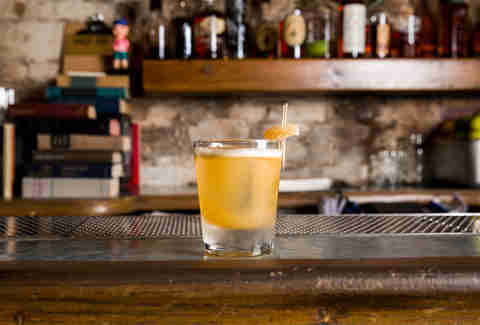 Walk past the deceptive “Tailors and Alterations” sign on the opaque window on Eldridge, enter the narrow, industrial-style space, grab a seat at the bar, and tell the bartender what you like to drink. 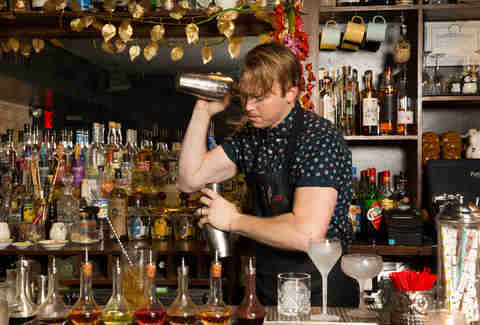 Housed in the old Milk & Honey space (and run by two vets of the iconic bar), Attaboy offers no menu -- instead, the talented staff will create a cocktail for you based on things like what spirit and flavors you’re in the mood for. 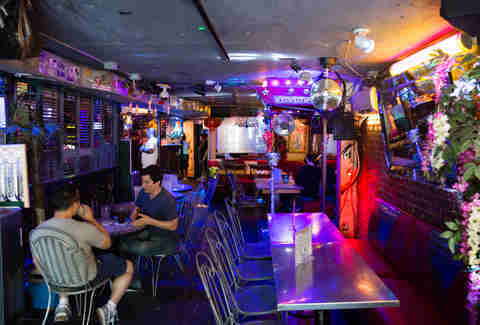 Relocated in 2014 from its original Ludlow Street location, this classic skater dive dating back to 1989 remains a hub for skaters (as well as those who have never stepped foot on a skateboard, but still enjoy cheap drinks). Paintings, drawings, and other works by local artists line the walls and there’s often live music from DJs and indie bands. Nitecap offers all the trappings of the perfect date spot: cozy booths, dim lighting, great cocktails, and perhaps most importantly, a huge disco ball. 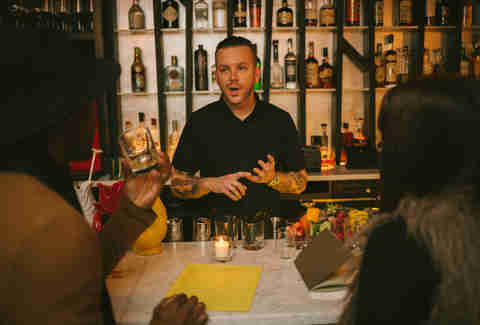 The drink menu changes twice a year and features dozens of smartly crafted cocktails ranging from shareable punches and boozy slushies to strong, liquor-forward cocktails, like a refreshing spritz with honeydew-infused vodka, sherry, aloe vera, lime juice, and seltzer. If your idea of a fun night out consists of slowly sipping wine, eating fancy bar bites, and actually hearing your friends speak, this laid-back hangout is your spot. 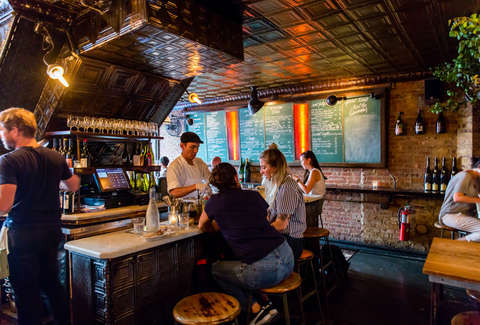 Outfitted in plenty of exposed brick, books, and record players, Bar Belly offers the perfect living-room feel, in addition to nightly oyster deals: $1.50 each from 5:30-7:30; $18 for six the rest of the night. 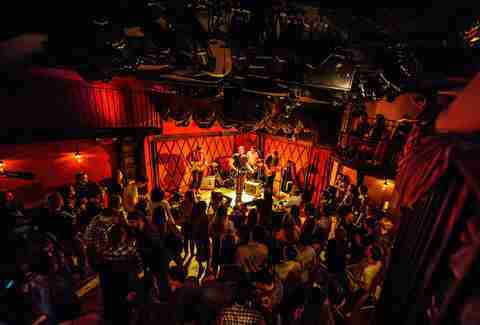 The three stages at this no-frills music club get filled with acts from all over the world every night of the week -- from your favorite indie (or signed) artists to a slew of other performers who may just make it on your daily Spotify list. Most of the shows are free (or have a one drink minimum, and you probably wanted that $6 bottle of beer anyway) or have cheap ($10) tickets. 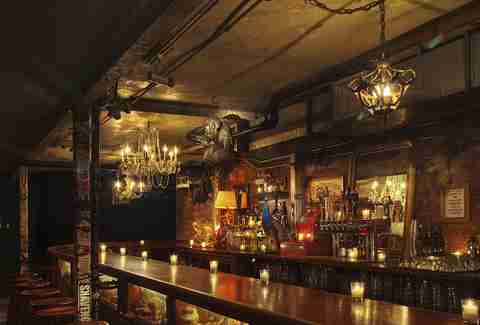 If you head further into Chinatown, you’ll find this dim, sign-free bar (a favorite of fashion types and neighborhood regulars alike) in the shadow of the Manhattan Bridge. Sip on house-infused spirits, like a Chinese celery-infused vodka tonic ($9) or an Old Fashioned stirred up with salty plum-infused bourbon ($9). If you’re hungry, order from a menu of Chinese-inspired snacks like Malaysian jerky and pork buns on potato rolls. The Ten Bells prioritizes naturally made wines by small producers, so expect to try a blend or bottle you’ve never tried before. Glasses start at $8 ($5 glasses of select wines are served before 7pm, as are $1 oysters), but the best deal is to share a $24 carafe while passing around tapas-style plates like croquettes, meatballs, and plenty of charcuterie and cheese.